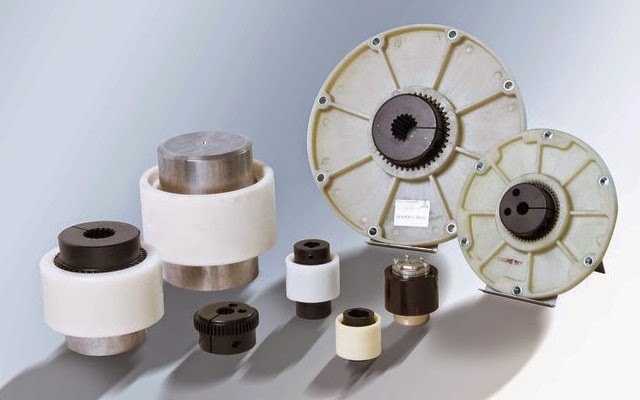 Departing from last week's focus on all metallic gear couplings, this post is focused exclusively on the sometime overlooked nylon sleeve gear coupling (i.e. -Lovejoy Sier-Bath Nyflex® and Mite® and R+L Hydraulics Dentex®). Nylon couplings are compact and require no lubrication. They operate over a wide temperature range at speeds up to 5000 RPM and are effectively used in applications such as motor/generator sets, pump sets and many light to medium duty industrial coupling applications. No lubricants are ever required, eliminating the need for seals. The resilient nature of the nylon material makes the contact of the hubs and sleeves almost frictionless. Not requiring lubrication readily permits the use of these couplings in vertical and blind assembly applications where the slip-together components offer easy inspection and adjustment. When completely assembled, the Mite coupling weighs less than 1 lb and the Nyflex only 3.5 lbs. The no-lubrication feature of nylon sleeve gear couplings readily permits their use in vertical applications and for blind assembly. To install, mount both hubs on the shafts; then place the sleeve with a ring in the center groove over one hub. When the connected unit is placed in position, the coupling is fully installed. The nylon sleeve coupling is typically used in similar type of applications as a jaw coupling. The nylon sleeve coupling can be used as a problem solver for the jaw coupling if the customer needed better axial float, a torsionally stiffer coupling, or higher misalignment capabilities. 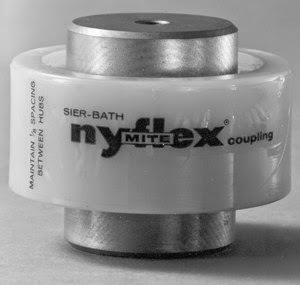 Note: Nyflex and Mite catalog torque ratings are speed dependent. This is due to heat buildup between the sleeve and hubs, which occurs from the sleeve rubbing against the hubs during rotation.